Katrina Olson demonstrated how attention to LinkedIn can drive business. Many people think of LinkedIn as merely a tool for recruiting. However, used correctly and with attention to detail, LinkedIn can be one of the most effective networking resources available. 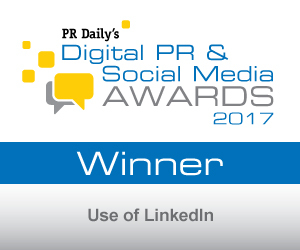 Katrina Olson proved that, and in doing so has won first place in the “Use of LinkedIn” category of PR Daily’s 2017 Digital PR & Social Media Awards. Olson had spent 10 years in the academic world teaching advertising, but she kept her hand in the business world with a small group of clients. One of those was the National Association of Electrical Distributors, for whom she delivered workshops, wrote articles and consulted on other marketing and PR issues. When she left academics and launched Katrina Olson Strategic Communications, Olson focused on LinkedIn to build her business. With 500 followers who had come her way since she opened her account in 2003, Olson used her contacts from attending the NAED marketing conference to send invitations to follow her. She acknowledged each person who did with a personal response and then tagged them (sales, marketing, manufacturer, or distributor) in order to better track them. Olson republished, with permission and attribution, the biweekly articles she had written for NAED’s tED magazine as LinkedIn articles and produced as many original posts as well. Making sure she published at least weekly, Olson steadily built a following, adding over 1,000 followers and netting an average of one profile view every day. She added four new clients to her roster with these tactics, while increasing business from existing clients and increasing her gross income by 70 percent. Congratulations to Katrina Olson for her remarkable success on LinkedIn.